Why use Pauli? It's free, frequently updated, has registered and unregistered cultivars, and is reviewed by a horticulturist taxonomist and Saintpaulia experts for accuracy. It is the ONLY AFRICAN VIOLET DATAFILE ANYWHERE that works on PC and Mac platforms, any laptop, netbook, Blackberry, nook, Kindle, Sony Bookreader, Palm, iPad, "clouds" like Google Fusion Tables, Google Docs, and nearly any phone including iPhone and Droid. You can modify it many ways for your projects including trade, sale, want, show, and collection lists. Now your AV data goes everywhere you and your plants go! Add version 1.1 through 1.3 data using this file: pauliadd.xls - in most cases you select the data then 1) merge or 2) cut and paste into your existing file. If using a database like Access import the new records using this XLS format. 1. VIOLET CLOUD - GOOGLE FUSION TABLE - no direct link is allowed - A) load www.google.com, B) select More menu from their top bar, C) select Even More at the bottom, D) click on Fusion tables, E) enter site or click Take Tour, F) enter Pauli in the search box, G) click the Paul AV listing that comes up - Once the table of data loads goto the View menu and click Filter. Enter your search criteria there. GOOGLE FUSION TABLES are perhaps the easiest and most capable format because 1) there's no need to download a file or own any software. This is one type of "cloud computing" with the data and software both on Google's server, 2) you have amazing search functions (use the Filter tab) similar to the most complex SQL database, and 3) many sharing and data display options. In some countries, regions you must register with Google to get this service. This is very new offering from Google (April 2011 we think?) so there are a few rough spots, but very few. For support visit Google Fusion Tables Help. GOOGLE DOCS - if you are Google member you can also access Pauli from their Spreadsheet interface by searching for it. 2. XLS spreadsheet with all instructions and Autofilter (for Microsoft Excel and other compatible system reading XLS files). You can use this with other programs including Quatro Pro and pretty much an Microsoft product that imports XLS files including Access. We dropped the first sheet into a blank Access table and it converted like a charm. XLS files are popular because more than 200 computers programs use XLS or Excel files as an exchange or import format. 3. Open Office Calc - free open source spreadsheet at least as good as Excel and Quattro Pro. Open Office is from Sun Microsystems and has been developed over two decades. It is just as good as Windows Office and is in some ways superior in our opinion. Goto http://www.openoffice.org and download the best version or your computer. Then import in the XLS Spreadsheet version of Paul from the link above in 2. Open Office Calc is a Microsoft Excel clone and much more! 4. Quatro Pro from the Word Perfect Suite - import the XLS format file from under 2. above. a spreadsheet app is the most powerful. Apps include iPhone Spreadsheet, Documents 2 Go, Quicksheet, Sheet 2, Spreadsheet LX, and Roambi. These will import Excel or XLS files (see 2. above to download). One alternative is CSV Torch will loads simple comma-delimited CSV files. 7. CSV file format (for use in comma-delimited databases or export). Most systems will accept XLS but if not this is a good small version. If you are a "tinkerer" do-it-yourself programmer who likes to use simple data separated by commas such as a BASIC, VISUAL BASIC, C++, or other code, do consider this format. This will work in DOS and many other non-PC environments with ease. 8. DBF file format for systems using the dBase style data. Be aware that many systems working with DBF files also import XLS files so consider using both. 9. DOCUMENTS 2 GO is a software platform that works on many handheld devices, phones, PDAs etc. Their website http://www.dataviz.com/products/documentstogo/ explains the details for Blackberry, Palm, iPhone, Droid, Google Ion, HTC, CLIO, T-Moble, and dozens of other products. This affordable software program will let you view Pauli files in Excel (XLS) and Adobe (PDF) formats. http://www.dataviz.com/products/documentstogo/ or Documents 2 Go lets you work with Pauli XLS and PDF versions. 11. Google Docs - Only version 1.1 is available at this time due to our current user testing project. Please the XLS or Google Fusion Table version for the newer versions. 12. Oracle support (Windows/Linux/Unix) - while Sun's Open Office is impressive their mainframe, heavy duty Oracle product has advantages for the search data cruncher. It competes with Microsoft Access and their own Open Office Base but you get powerful report functions, security, and it runs on Windows, Linux, and Unix systems. Single users start at $180.00 if you register 5 or more users (May 2010). The http://sourceforge.net/projects/xls2oracle/ or XLS2Oracle open source code will get Pauli XLS files to Oracle with ease. 13. Mac OS X 10.5 (Tiger) and higher - we recommend the http://www.openoffice.org programs Open Office Calc (most users) and Open Ofifce Base (advanced users) as both will accept the Paul XLS format. http://www.openoffice.org or Open Office with Calc and Base programs which take Pauli XLS files with ease. 13. Reports (fixed tables derived from database) - not sortable or searchable - but quicker for reference. These are best for phones and tablet devices which do not have spreadsheet or database software but can use PDF files. 3. If you wish to be listed as a source for violet cultivars, please send us your link, showing the active Pauli link to www.cultivar.org and we'll add you. No sources will be listed until your link is posted and available to the public. PAULI is not intended to be a complete database of the 21,000 or so named clones, 90% of which are out of the trade, nor is it an official register of any society or ICRA. Some claim over 40,000 clones are named if you count numbered hybrids. You and I can only buy or trade for a fraction of that total so the rest is pure academic history. This searchable, sortable file is being developed in the public interest by the New Ornamentals Society (http://www.cultivar.org), the longest serving plant society devoted To horticultural taxonomy and cultivar selection. Our first cultivar selection computer database (ConiferBase) dates from 1982 and the NOS now offers over 2 Gigs of data. We hope to provide a modern, practical, and did we mention...100% free... database to the best cultivars in the trade today. PAULI uses basic Autofilter technology, producing pull-down menus to let you select a cultivar on one to eight criteria. We expect two, three, or four criteria to be most common in selections. HOW TO SELECT CULTIVARS: Click on the downward black arrow next to the datafield names (Corolla Color, Color Type, Habit etc.). There are many possible combinations. If the arrows are missing, select the entire block or range of data then goto Data - Autofilter. USE A YOUR COLLECTION DATABASE: download a copy. Use the Collection datafield to record what you Have, are offering for trade (leaf or plant), for sale (leaf or plant), as a want list, etc. You can then select a list of each category to produce a want list, Trade list, sales list, etc. Do remember that you can add as many new cultivars and records as you want with this this free, open format. Such as Corolla Color=white and Habit=Semi for a white-flowered semiminature. TO RESTORE OR CLEAR YOUR SEARCH CLICK ON “All” UNDER EACH DATAFIELD. Copyright 2011. Laurence C. Hatch. All Rights Reserved. Please cite this work as follows: Hatch, L.C. 2011. Pauli. African Violet XLS Database. www.cultivar.org Your rights: you must agree to all these terms or your rights to use this product or retain any copies is immediately terminated: 1. You may download up to three copies for Personal or commercial use on various devices (desktop, laptop, Blackberry, iPad, iPhone, or other spreadsheet reader), 2. You may not distribute any copies yourself and That includes any modifications or changes of any kind to this document – all distirbution is via www.cultivar.org download only. 3. You are encouraged to link to this System but only via www.cultivar.org. Direct links to any spreadsheet filename or URL are not permitted. 4. You may distribute lists and reports if not in XLS or ODS format So long as the spreadsheet itself is not copied nor is is distributed with more than 70% of content conveyed via any means, method, website, or portal. 5. This is not a public Domain document, it is not subject to “fair use”. 6. If this document in whole or part is used for distribution in an educational or commercial context for which tuition, consulting Fees, class fees, seminar charges, or other compensation is paid you must be a member of the New Ornamentals Society in good standing with all dues paid. Members get more. Margined – thin to wide picotee or edge of contrasting color. A fine contrasting picotee is often called a Geneva edge. Thumbprint – a distinct spot or central color zone in the middle of the petal as if stamped by a finger. But where does a big print end and a white margin on blue or pink begin? Why use phrases like "red dark" instead of "dark red"? Good question. This way when you sort by the corolla color field, all the reds, pinks, blues, etc. are grouped together. Dark red would group with dark pink and dark green - which is a missed opportunity for grouping cultivars. In Google Fusion Table you can also specify "corolla color starts with...." a color term and this lets us list all the blues, reds, pinks, etc. regardless of intensity, patterns, etc. 1. Use the "contains" option when searching on corolla color. You could say "contains green margined" and list all the green-edged cultivars regardless of base color. This list would pull white margined green, pink dark margined green, blue light fantasy violet margined green, etc. 2.Want a list of all fantasy clones or chimera (bar, stripped) clones, again use the "contains" option for the terms "fantasy" and "bar". You'll get white fantasy violet along with violet fantasy pink. "purple" - we use violet such as violet light, violet medium, violet dark. There is technically much difference between purple and violet (the later being a more pinkish or coral-toned shade). In truth, most "purple violets" have strong violet tones, so the two terms are merged as separate is nearly a hopeless exercise. "fuchsia" - fuchsia is different things to different people. The British have a different standard than Americans. In general, we use "pink dark (magenta)" or "pink dark (coral)", the later less harsh and with fewer blue tints for what is called fuchsia. Some people consider mauve and fuchsia to be the same color and that is another issue with trade terms. The "violet-red" color of this database is also part of what some people think of the term fuchsia. "cream" - white is used since most white flowers in any plant have cream tones are first or later when fading. A yellowish-cream flower here is "white tinged yellow"
"gold" - we are using yellow light, yellow medium, yellow dark, etc. "red" - wow, where do we begin? Everyone wants to offer a true red violet but many are not. The codes red light, red medium (rose-red), and red dark (cranberry) are used for true reds. Violet-red reflects a more grapey or intense rosy-red shade of things. "burgundy" - this should ideally have some relation to the wine of this name. People use burgundy for what are called here red dark, violet-red dark, and violet dark. Single - most flowers have 5 basic petals, mostly in a flat face, if cupped, not strongly so. Semi-double - having 6 or more petals and petaloids (minor, reduced petals), the center often clustered with many tiny petaloides. Double - having 10 or more petals, usually these of nearly equal size, overlaps with "semi-double" and many plants have both types. If the cultivar often attains the true double morphology, we will pick this term for it. Crisped – very finely toothed, lacy, crested, or sharply toothed edges. Many of the green-edged clones are crisped. Some have distinctly folded and fluted edges which are noted in the Misc. field. Others are more fimbriated (finely incised, lacy) while others are more serrulate (finely toothed) on close inspection. LEAF GROUP: We are trying to restore classic terminology here and not using the amateurish, even if traditional terms of AV societies. Professionalism matters. to refer to a cupped, concave leaf. Green undulate – a wavy or ruffled leaf, sometimes called a Longifolia leaf in society circles even if not long!!! A variegated undulate leaf is coded by color (ie. white-margined, gold-mottled) and the margin notes in the Misc. field instread. Green clacamas - leaves mostly narrowly ovate to elliptic, notably with 5-7 parallel or closely spaced reddish or bright pink veins on the leaf reverse, contrasting with the silvery to silvery-green base color. In some clones there is paler striations or veins above too in a so-called watermelon-like pattern; this being a very imprecise and ill-defined term. Veins can be arcuate or incurved as Dogwood (Cornus) in some cases. state was added with Version 1.2. White-mottled – leaf is spotted white over most of the surface, not confined in general to marginal spots. These are called in most AV circles a “mosaic”, a horrible word implying a mosaic virus infection. Gold-mottled - similar to the above but markings in in yellow, gold, tan, or beige tones. "Mosaic" in AV literature. Pink-mottled – as white-mottled but light pink to medium pink markings, often a silvery-rose shade. MISC – general comments on the cultivar, including unique traits, clarifications of other fields, etc. hard to make at times and most trailers are in general quite small. CULTIVAR FINDER LINKS: Beginning in version 1.2 we are filling up the Collection field with live, internet source links to major vendors. We are beginning with established, reliable vendors like Lyndon Lyon, Violet Barn, Blue Bird, Karen Dean, Violet Gallery, and several others we can personally recommend. You can easily produce trade, want, and sales list by sorting on this field. Be certain to select the entire database before sorting. VERSION – this identifies under which version each cultivar (or amended record thereof) was issued. Experience, your author has proven this kind of system works well for everyone. GOOGLE FUSION TABLE does not permit additions because viewing it is open to the general public on a real time basic. Without scientific and expert review all sorts of chaos would surely insue. 1. Go to the bottom the sheet and select the blank line under the last entry. 2. Enter your text in the exact columns, using the same codes. 3. When sorting or refreshing the Autofilter be sure to You specify select the entire new range of cells. Otherwise you may only filter or sort the original data. ALWAYS SAVE A BACKUP COPY OF YOUR DATA BEFORE MODIFYING ANYTHING. In our alpha test, the major problem users had with adding cultivars were these issues to avoid: 1. Use the same field names as the original database. If we specify “blue dark” for corolla color and you enter “blue – dark” or Or “blue very dark”, the selection will favor these are different characters 2. When sorting or resetting the autofilter, always select the rows which contain your new data. You must include them. 3. Your additions will not be selected unless you specify the new expanded data range and select Data – Autofilter again. You must do this Every time a single cultivar is entered. Best cultivars? Who decides which are the best 1000 cultivars? This was a decision of the New Onramentals Society staff including Director Laurence Hatch who has grown Saintpaulia for three decades. We also use trade listings to determine what cultivars are popular. High ebay bid attention (not prices), that is, the number of bidders is also considered. Awarded cultivars from local Conventions are also used for our input. Copyright: as follows: Copyright 2011. Laurence C. Hatch. All Rights Reserved. Corrections – these are very welcome. Be specific and email the change requests to ornamentals@lycos.com . To got back to a full, unfiltered list click on "clear filter"
January 2011 - idea suggested by Larry Hatch of the New Ornamentals Society to society board members as a means of providing content to the forthcoming 1300-page encyclopedia of interior and house plants being developed for 2013 release. March 2011 - test versions offered to NOS members and experts, character state terms standardized. Version field for 1.0, 1.1, 1.2, etc. developed so users could update their already modified files to whatever version they needed with ease. 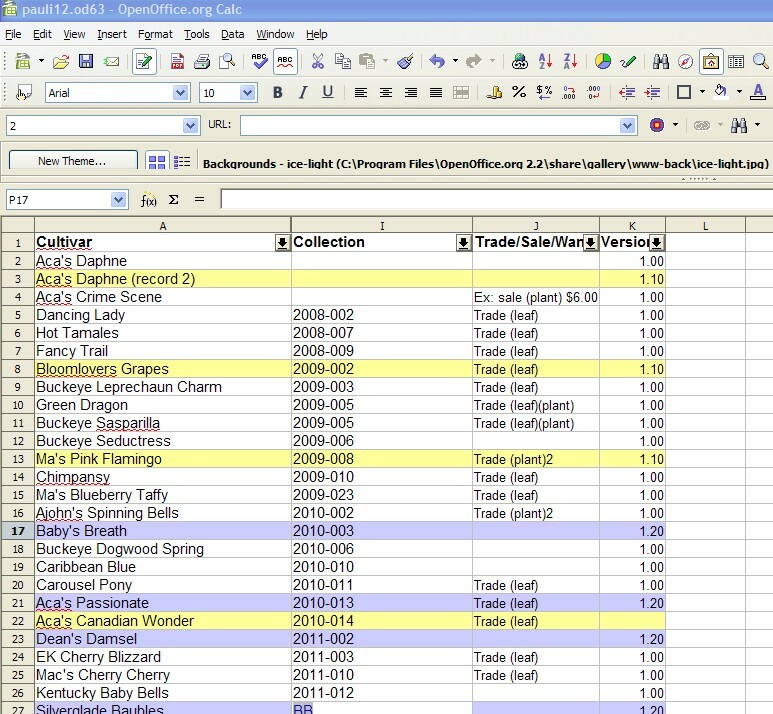 April 2011 - data fields expanded to include collection management and trade/sale/want list functions so the system will appeal to serious AV collectors and vendors. Version 1.0 offered via Google and other search engine links, cultivar.org, and ebay listings of leaves for sale. ODS, XLS, CSV, and fixed report HTML and PDF cultivar tables offered. DBF version test version discontinued. Google Fusion Table added and recommended as the primary easy-to-use system requiring no downloads and no software. May 5, 2011 - version 1.1 released with 1310+ different cultivars. June 10, 2011 - version 1.2 released with 1600 different cultivars, CULTIVAR FINDER links added, new leaf types, and several corrections. June 21, 2011 - version 1.3 released with 2000 different cultivars, adding live source links to major nurseries. I attended the State University of New York at Farmingdale on Long Island and earned an AAS in Nursery Management in a strict, rigid program that taught horticulture from the approach of the apprenticeship model. From this wonderful location in 1978 I learned from the area's amazing gardens including New York Botanical, Brooklyn BG, Planting Fields Arboretum, Bayard-Cutting, Bailey Arboreutm, and many others. In 1980 I was blessed to earn a scholarship to Cornell University, working with Dr. Bob Mower with a specialty in plant materials and taxonomy. Learning from the great professors at the Bailey Hortorum (Drs. Ingram, Dress, and Hyypio in particular), 1983 took me to Raleigh, North Carolina to earn a Masters in Ornamental Horticulture, specializing in Horticultural Taxonomy under Drs. Paul Fantz, a noted horticultural taxonomist, the famous JC Raulston, and world-renowned woody plant taxonomy James Hardin, then editor of Systematic Botany. My thesis TAXONOMIC STUDIES OF THE CULTIVATED JUNIPERUS HORIZONTALIS MOENCH covers 58 cultivars of that difficult species and allowed me to study collections far and wide, resulting in a 354 page study of those complex cultivars. In our study of many sports, the cultivars LIMEGLOW 'Noslg' and 'Silver Sheen' were named. It was wonderful to work at the NC State University Arboretum (now Raulston Arboretum) for four summers, working the Dr. Raulston in labeling and identifying plants from his amazing collection and propagaging amazing new cultivars and Asia seeds he collected from around the world. In 1982 I became impressed with both the IBM PC and Mac and worked early on to use both for plant databases. In those years, Dr. JC Raulston bought . IIn 1983,Using a Tandy TRS-80 II computer, I created ConiferBase I, which allowed you to sort and search for conifers by habit, vigor (full to dwarf), foliage color, and foliage type. We had swap in and out big floppy diskettes, each of which held only 64K of very abbreviated, coded data (P=pyramidal, G=gold). The printouts were mailed to a number of friends who are now all legends in the conifer world - Humphrey Welch, Jean Iseli, Tom Dilatush and JC Raulston. Iseli told me about his new mutations and seedling and shared enveloped after envelope of dot matrix, folded pages with his own amazing inventory of plants. Computers got better and soon we formed Taxonomic Computer Research (TCR) in 1983 releasing a word-processed guide to the latest cultivars called the REFERENCE GUIDE TO ORNAMENTAL PLANT CULTIVARS. Getting my own computer with a shocking large 10MB hard-drive for the time - something which was said to be able to hold any professionals life's work with ease. People criticized me for the expensive excess of the 10MB drive because 3.5 inch diskettes were now cheap and could be switched in and out with ease. Today I have digital photographs from my Nikon camera which are 7MB in size. How little we knew back then. Any-hoo, the PLANT DATABASE LIBRARY was developed by TCR and myself and we offered IBM PC databases which would run with PC-FILE dBase, and many other programs to let your select 800 azaleas, 2200 woody plants, 1300 perennials, 300 rhodies, and 1400 conifers with ease. Bulbs modules were sold later but did not have as wide a following. Annual updates were issued to thousands of users in 17 countries. African violets came into my focus when as student at Farmingdale the adjacent Arcadia Nursery offered an assortment of cute-as-buttons miniature or at least tiny pots of cultivars in full bloom. Wth what little moneyI had I filled by dorm window with them and more than once gave away a plant to a pretty girl who asked for it. Over some months I attained 20 different cultivars of all sizes and found them wonderful. The Saintpaulia bug subsided for some years though at Cornell I enjoyed the worldclass Gesneriad collections there. I grew to occasional violet over the years but when coming to North Carolina I decided to learn more about indoor gardening with banks of 48 double-tube lights. Dwarf succulents, violets, and all sorts of odd things filled my home. Nowadays I grow about 200 different violets at any given time, always the most interesting things, and give away or sell the boring stuff as time moves on. We kniow that the success of the PAULI Project like most free data sources lies with users and in the final analysis developers who make it better, more flexible, and unleash creativity that will allow the data to stand the tests of time. The New Ornamentals Society is prepared to assist developers who want to use Pauli data in developing free, shareware, or paid tools or programs. If you have an idea to use Pauli data in a new way, write us at ornamentals@lycos.com and we'll make users here aware of your product, your terms, etc. 2. http://database.sourceforge.net - Simple Swing Database takes Pauli CSV fomat (comma-delimited) data and loads a simple speadsheet which can be sorted. The rest is up to you and your coding skill. We were impressed because we simply downloaded the program, clicked File- Open, and it was instant data. Not very many open source downloads are this clear and easy. 3. http://www.flysuite.com/en/start_flycalc.php?ww=us or Fly Calc is a C++ tool for managing Excel XLS files. It's fast online or offline, works on many computer platofmrs, and has many processing and filtering options already to go. Registration is justt $39 and this includes online collaboration. They also offer FlyBases with Access-style functions . Mary could have just cut and paste this list out of Pauli. Instead she did more and sent a Screen-Print using the useful PicPick program (http://www.picpick.org/). Copyright 2011. Laurence C. Hatch. All Rights Reserved.